Describe the use of heat engines in heat pumps and refrigerators. Demonstrate how a heat pump works to warm an interior space. Explain the differences between heat pumps and refrigerators. Calculate a heat pump’s coefficient of performance. Figure 2. Heat pumps, air conditioners, and refrigerators are heat engines operated backward. The one shown here is based on a Carnot (reversible) engine. (a) Schematic diagram showing heat transfer from a cold reservoir to a warm reservoir with a heat pump. The directions of W, Qh, and Qc are opposite what they would be in a heat engine. (b) PV diagram for a Carnot cycle similar to that in Figure 3 but reversed, following path ADCBA. The area inside the loop is negative, meaning there is a net work input. There is heat transfer Qc into the system from a cold reservoir along path DC, and heat transfer Qh out of the system into a hot reservoir along path BA. The great advantage of using a heat pump to keep your home warm, rather than just burning fuel, is that a heat pump supplies Heat transfer is from the outside air, even at a temperature below freezing, to the indoor space. You only pay for and you get an additional heat transfer of from the outside at no cost; in many cases, at least twice as much energy is transferred to the heated space as is used to run the heat pump. When you burn fuel to keep warm, you pay for all of it. The disadvantage is that the work input (required by the second law of thermodynamics) is sometimes more expensive than simply burning fuel, especially if the work is done by electrical energy. The basic components of a heat pump in its heating mode are shown in Figure 3. A working fluid such as a non-CFC refrigerant is used. In the outdoor coils (the evaporator), heat transfer occurs to the working fluid from the cold outdoor air, turning it into a gas. Figure 3. 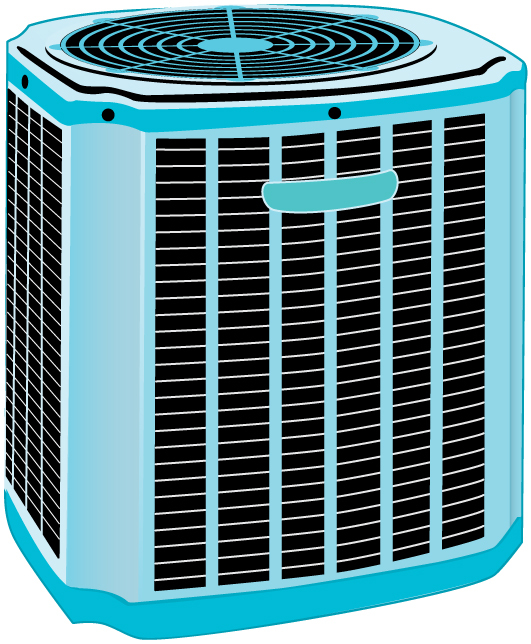 A simple heat pump has four basic components: (1) condenser, (2) expansion valve, (3) evaporator, and (4) compressor. In the heating mode, heat transfer Qc occurs to the working fluid in the evaporator (3) from the colder outdoor air, turning it into a gas. The electrically driven compressor (4) increases the temperature and pressure of the gas and forces it into the condenser coils (1) inside the heated space. Because the temperature of the gas is higher than the temperature in the room, heat transfer from the gas to the room occurs as the gas condenses to a liquid. The working fluid is then cooled as it flows back through an expansion valve (2) to the outdoor evaporator coils. Since the efficiency of a heat engine is we see that an important and interesting fact. First, since the efficiency of any heat engine is less than 1, it means that is always greater than 1—that is, a heat pump always has more heat transfer than work put into it. Second, it means that heat pumps work best when temperature differences are small. The efficiency of a perfect, or Carnot, engine is thus, the smaller the temperature difference, the smaller the efficiency and the greater the (because ). In other words, heat pumps do not work as well in very cold climates as they do in more moderate climates. Friction and other irreversible processes reduce heat engine efficiency, but they do not benefit the operation of a heat pump—instead, they reduce the work input by converting part of it to heat transfer back into the cold reservoir before it gets into the heat pump. Figure 4. When a real heat engine is run backward, some of the intended work input (W) goes into heat transfer before it gets into the heat engine, thereby reducing its coefficient of performance COPhp. 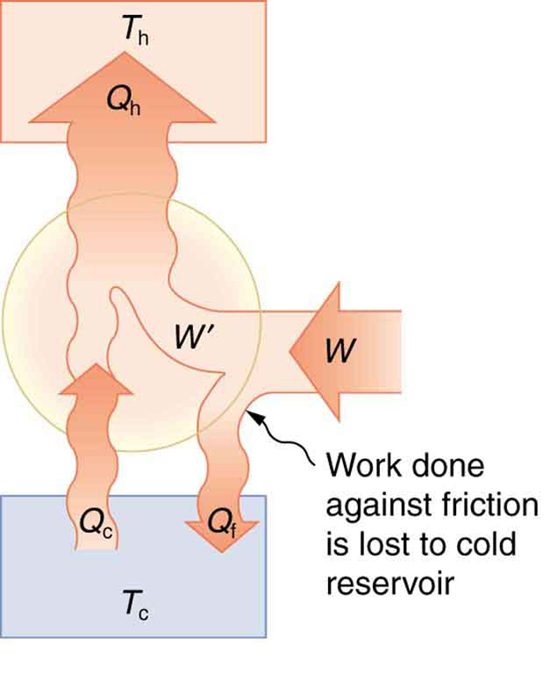 In this figure, W‘ represents the portion of W that goes into the heat pump, while the remainder of W is lost in the form of frictional heat (Qf) to the cold reservoir. If all of W had gone into the heat pump, then Qh would have been greater. The best heat pump uses adiabatic and isothermal processes, since, in theory, there would be no dissipative processes to reduce the heat transfer to the hot reservoir. A Carnot engine reversed will give the best possible performance as a heat pump. As noted above, so that we need to first calculate the Carnot efficiency to solve this problem. This result means that the heat transfer by the heat pump is 5.30 times as much as the work put into it. It would cost 5.30 times as much for the same heat transfer by an electric room heater as it does for that produced by this heat pump. This is not a violation of conservation of energy. Cold ambient air provides 4.3 J per 1 J of work from the electrical outlet. Figure 5. 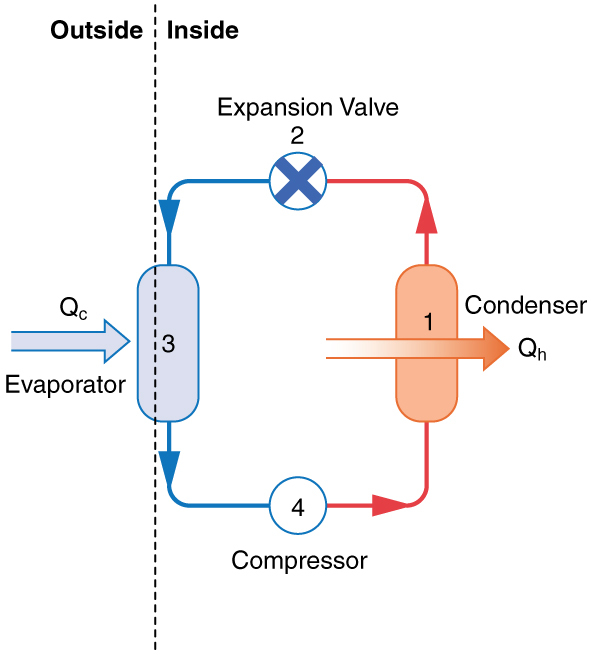 Heat transfer from the outside to the inside, along with work done to run the pump, takes place in the heat pump of the example above. Note that the cold temperature produced by the heat pump is lower than the outside temperature, so that heat transfer into the working fluid occurs. The pump’s compressor produces a temperature greater than the indoor temperature in order for heat transfer into the house to occur. Real heat pumps do not perform quite as well as the ideal one in the previous example; their values of range from about 2 to 4. This range means that the heat transfer from the heat pumps is 2 to 4 times as great as the work put into them. Their economical feasibility is still limited, however, since is usually supplied by electrical energy that costs more per joule than heat transfer by burning fuels like natural gas. Furthermore, the initial cost of a heat pump is greater than that of many furnaces, so that a heat pump must last longer for its cost to be recovered. Heat pumps are most likely to be economically superior where winter temperatures are mild, electricity is relatively cheap, and other fuels are relatively expensive. Also, since they can cool as well as heat a space, they have advantages where cooling in summer months is also desired. Thus some of the best locations for heat pumps are in warm summer climates with cool winters. Figure 6 shows a heat pump, called a “reverse cycle” or “split-system cooler” in some countries. Figure 6. In hot weather, heat transfer occurs from air inside the room to air outside, cooling the room. 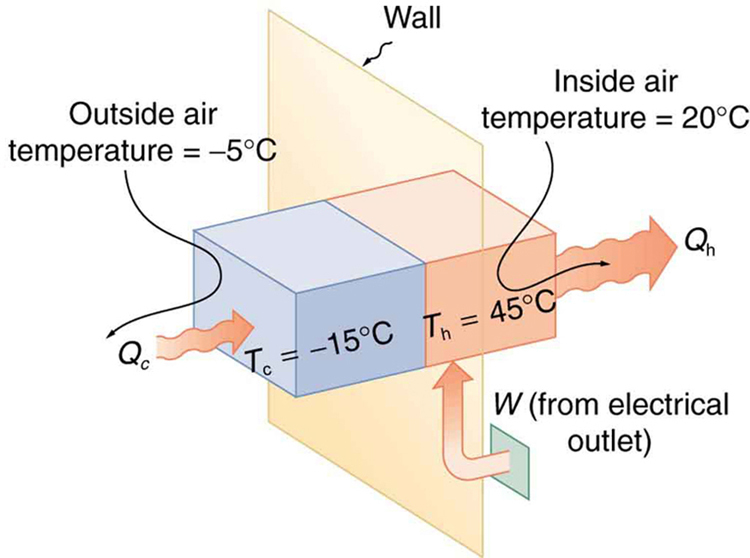 In cool weather, heat transfer occurs from air outside to air inside, warming the room. This switching is achieved by reversing the direction of flow of the working fluid. for a heat engine used as either an air conditioner or a heat pump operating between the same two temperatures. Real air conditioners and refrigerators typically do remarkably well, having values of ranging from 2 to 6. These numbers are better than the values for the heat pumps mentioned above, because the temperature differences are smaller, but they are less than those for Carnot engines operating between the same two temperatures. A type of rating system called the “energy efficiency rating” ( ) has been developed. This rating is an example where non-SI units are still used and relevant to consumers. To make it easier for the consumer, Australia, Canada, New Zealand, and the U.S. use an Energy Star Rating out of 5 stars—the more stars, the more energy efficient the appliance. are expressed in mixed units of British thermal units (Btu) per hour of heating or cooling divided by the power input in watts. Room air conditioners are readily available with ranging from 6 to 12. Although not the same as the just described, these are good for comparison purposes—the greater the the cheaper an air conditioner is to operate (but the higher its purchase price is likely to be). where is the amount of heat transfer from a cold environment in British thermal units, is time in hours, is the work input in joules, and is time in seconds. Examine the situation to determine whether heat, work, or internal energy are involved. Look for any system where the primary methods of transferring energy are heat and work. Heat engines, heat pumps, refrigerators, and air conditioners are examples of such systems. Identify the system of interest and draw a labeled diagram of the system showing energy flow. Identify exactly what needs to be determined in the problem (identify the unknowns). A written list is useful. Maximum efficiency means a Carnot engine is involved. Efficiency is not the same as the coefficient of performance. Make a list of what is given or can be inferred from the problem as stated (identify the knowns). Be sure to distinguish heat transfer into a system from heat transfer out of the system, as well as work input from work output. 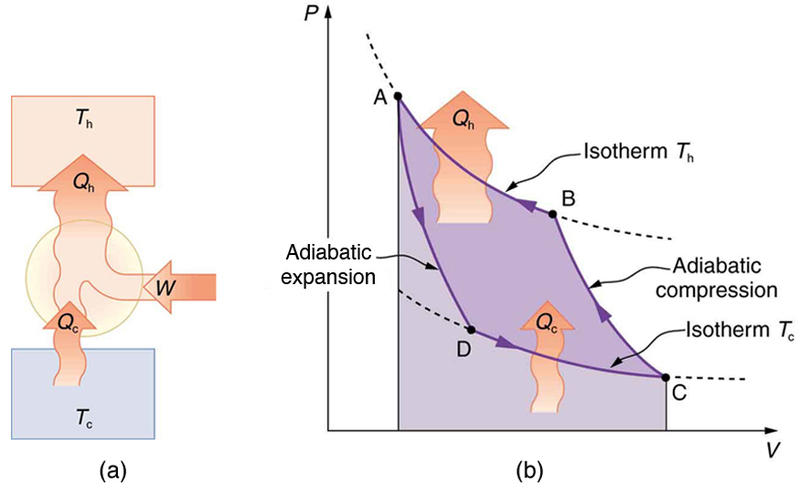 In many situations, it is useful to determine the type of process, such as isothermal or adiabatic. Solve the appropriate equation for the quantity to be determined (the unknown). Substitute the known quantities along with their units into the appropriate equation and obtain numerical solutions complete with units. Check the answer to see if it is reasonable: Does it make sense? For example, efficiency is always less than 1, whereas coefficients of performance are greater than 1. An artifact of the second law of thermodynamics is the ability to heat an interior space using a heat pump. Heat pumps compress cold ambient air and, in so doing, heat it to room temperature without violation of conservation principles. 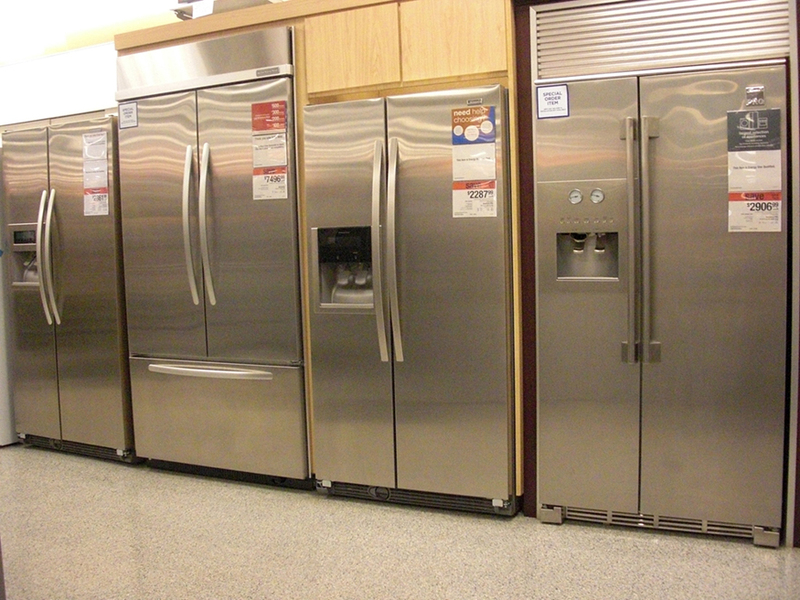 A refrigerator is a heat pump; it takes warm ambient air and expands it to chill it. 1: Explain why heat pumps do not work as well in very cold climates as they do in milder ones. Is the same true of refrigerators? 2: In some Northern European nations, homes are being built without heating systems of any type. They are very well insulated and are kept warm by the body heat of the residents. However, when the residents are not at home, it is still warm in these houses. What is a possible explanation? 4: Grocery store managers contend that there is less total energy consumption in the summer if the store is kept at a low temperature. Make arguments to support or refute this claim, taking into account that there are numerous refrigerators and freezers in the store. 5: Can you cool a kitchen by leaving the refrigerator door open? 2: Suppose you have an ideal refrigerator that cools an environment at and has heat transfer to another environment at What is its coefficient of performance? 4: In a very mild winter climate, a heat pump has heat transfer from an environment at to one at What is the best possible coefficient of performance for these temperatures? Explicitly show how you follow the steps in the Problem-Solving Strategies for Thermodynamics. 6: (a) What is the best coefficient of performance for a refrigerator that cools an environment at and has heat transfer to another environment at (b) How much work in joules must be done for a heat transfer of 4186 kJ from the cold environment? (c) What is the cost of doing this if the work costs 10.0 cents per (a kilowatt-hour)? (d) How many kJ of heat transfer occurs into the warm environment? (e) Discuss what type of refrigerator might operate between these temperatures. 7: Suppose you want to operate an ideal refrigerator with a cold temperature of and you would like it to have a coefficient of performance of 7.00. What is the hot reservoir temperature for such a refrigerator? 8: An ideal heat pump is being considered for use in heating an environment with a temperature of What is the cold reservoir temperature if the pump is to have a coefficient of performance of 12.0? 9: A 4-ton air conditioner removes (48,000 British thermal units) from a cold environment in 1.00 h. (a) What energy input in joules is necessary to do this if the air conditioner has an energy efficiency rating of 12.0? (b) What is the cost of doing this if the work costs 10.0 cents per (one kilowatt-hour)? (c) Discuss whether this cost seems realistic. Note that the energy efficiency rating of an air conditioner or refrigerator is defined to be the number of British thermal units of heat transfer from a cold environment per hour divided by the watts of power input. (c) To transfer heat pump costs $1.00, natural gas costs $1.34. (c) This cost seems quite realistic; it says that running an air conditioner all day would cost $9.59 (if it ran continuously). 15.5 Applications of Thermodynamics: Heat Pumps and Refrigerators by OpenStax is licensed under a Creative Commons Attribution 4.0 International License, except where otherwise noted.